By now you have probably seen those inverted tomato planters. You are probably also wondering if they really work. The answer in short is yes. So as long as you give the tomato plant plenty of sun, water, and room for their roots to grow, it will work. 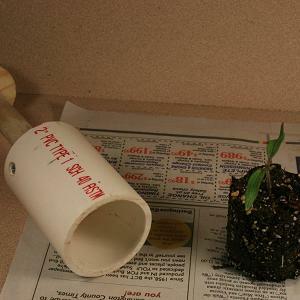 However, did you also know that you can build your own upside down planter with some basic material and of course a tomato plant? Well, you can. Here is a great step by step instructional to do just that. If you are short on garden space, but have a lot of hanging space, then this is yet another tool for you to use to expand what you can grow, by utilizing vertical area you may not have thought you had. Using a trellis in your home vegetable garden has a wide range of benefits. For starters it allows you take advantage of vertical real estate you may not have though of. You save a lot of space when growing vertically and a trellis allows you to do just that. Second, some items grow great on a trellis and I could not imagine growing them any other way, such as cucumbers. Here is an excellent trellis that you can build with some basic materials, a little time and folds up for better storage in the offseason. Screening your compost is a good idea. You will be able to filter out many larger items that have yet to break down which you can easily toss back onto your compost pile. If you keep a vermicompost bin like I do, then screening is also a great way to make sure your worms do not end up in your garden. 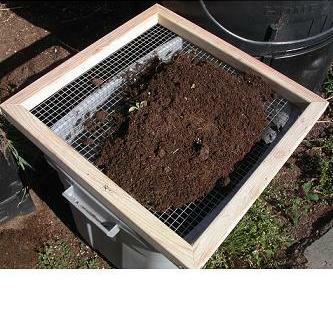 Worms in your garden are not a bad thing, but you want to keep your worms doing their jobs in your vermicompost bin. 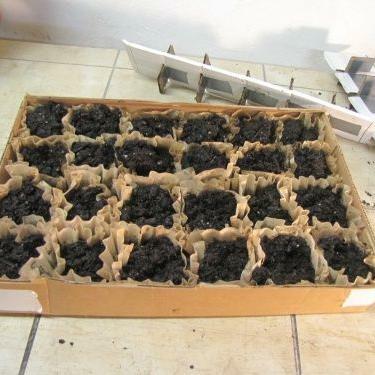 Soil blocks are an excellent way to keep your plants from experiencing any type of shock during transplant and are recommended by many gardening experts from around the globe. You could go out and buy a soil block maker for $20 to $50, or, with some basic skills and household items, you could put together one for under $5. I came across this project while perusing some Facebook pages, and had to take a closer look. After reading the step by step instructions I just had to share with our gardening community. 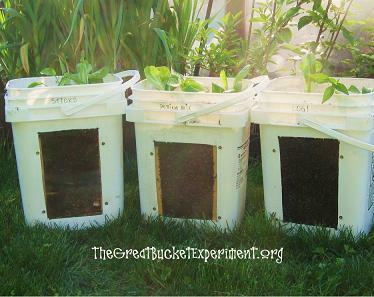 I had to share because I think it is a very creative idea and twist to container gardening, and I know many of you out there love to grow a lot things in containers (me included). I am always looking for new and creative ways to start seeds. And just as importantly, ways that are inexpensive as well. Buying supplies from the store can add up over time. However, this method, is virtually free. Free because you more than likely have all the supplies needed to build it. If you have about 20 minutes and basic (and I mean real basic) arts & crafts skills, then you have just about everything you need to create this seed starting tray. Who doesn't get excited when the seed catalogs start arriving in the mail or when you browse the web looking at the many different things you can grow from seed? I know I do. So you can imagine how anxious I get as a seed retailer, with thousands of vegetable seeds staring at me, when vegetable gardening season is so close at hand. Like you, I am ready to get my tomatoes, peppers, eggplant and basil all going, even if the weather tells me otherwise, and in 2013, the weather has been saying all kinds of crazy things. One day it's 80 degrees, the next 50. Those types of temperature swings make it tough to pinpoint when you can move your young seedlings outdoors. I will save that for a future article. Today, I wanted to concentrate of why you need to start your vegetable, fruits and herbs from seed. Specifically, let's talk about four benefits. I won't say that I am a control freak, but when it comes to my garden, I sort of am. When planting from seeds, you are in complete control from beginning to end of that plant and your garden. You know where your seeds come from, what is in your soil to make your vegetable seeds grow and so on. Buying seeds is much cheaper than buying the equivalent number in plants. So, for example, in a typical tomato seed packet, you will receive a couple hundred seeds. If you were to buy that number of plants, one, you probably would not have enough room for all of them, and two, that cost would be astronomical. When stored properly, your vegetable seeds can last you for many years. Proper storage simply means a cool, dry location. I have onion seeds that are 9 years old and I am still getting those onion seeds to germinate. This means you won't have to plant all of your seeds from your packet. You can plant the seeds that you need and save the rest of your seeds for subsequent years. I like to start a bunch of seeds of the same variety in a single planting pot, then thin the seeds out as the seeds germinate and get bigger. This comes in handy when indoor space is limited, such as is the case for what I have available on my window sill. I can have 7 different varieties going at once on one window sill, and when the time comes, I will thin the seedlings out. I am sure if I were to post the question on our Facebook page, "What are your benefits for starting your veggies, fruits and herbs from seed? ", I would get hundreds of different reasons. These are 4 that I believe are good reasons to start your garden from seeds. If you have always wanted to get a jump on your vegetable gardening season, but lacked the space (or funds) for a greenhouse, then here is a solution that is sure to solve both of those problems. This is a counter top greenhouse that you can build with some simple tools, basic woodworking skills and for less than $20. Heck, you may be able to find these supplies for free if you look hard enough. Holy Rhubarb Batman! I found this awesome Rhubarb and Strawberry preserve canning recipe on the blog Pink Cookies with Sprinkles and had to share it. 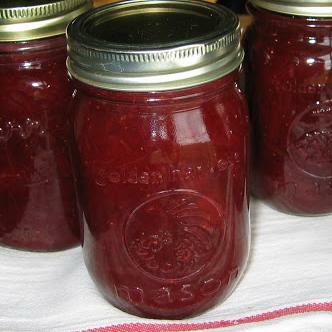 If you have basic canning skills and the desire to turn those home grown strawberries and your Rhubarb into something awesome, then you need to give this recipe a try. There is also a bonus recipe here for Rhubarb Strawberry Crisp. Mosquitoes can be a pain in the "you know what". You certainly can put on some repellent such as Off! or burn a citronella candle. Both will work. However, wouldn't you like some natural insect repellent for your entire yard? Well look no further. The five plants shown in the picture each give off their own unique scent which can throw off the sensory perception of mosquitoes ... i.e. they can't find you. Sure this isn't 100% fail proof, but it will help, and you will also get a really nice looking landscape in the process. Do you have a cherry tree or access to the boat loads of cherries that a cherry tree will produce? 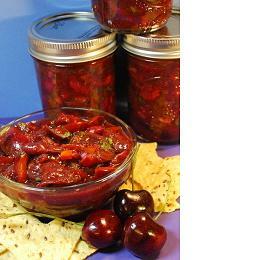 If so, then here is a great canning recipe for you. All you need are some basic supplies, ingredients (many of which you can grow yourself), and some basic canning skills. Put these altogether and you will be all set to make your very own cherry salsa.